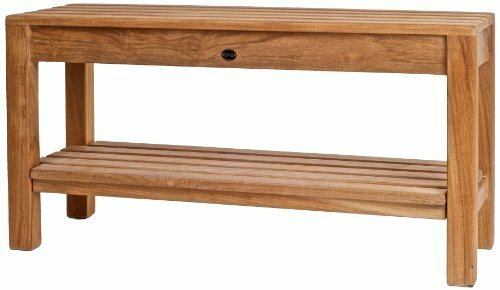 The ARB SpaTeak Fiji Teak Corner Shower Bench with Shelf crafted from all natural teak wood. Maybe you find sitting while bathing more practical or perhaps you just want to take some time to relax in your shower, With this durable and roomy bench, you can enjoy a sturdy place to sit in your bathroom. The bench doubles as a storage shelf on the bottom open section, you can easily stash toiletries, sponges and other bathroom accessories. 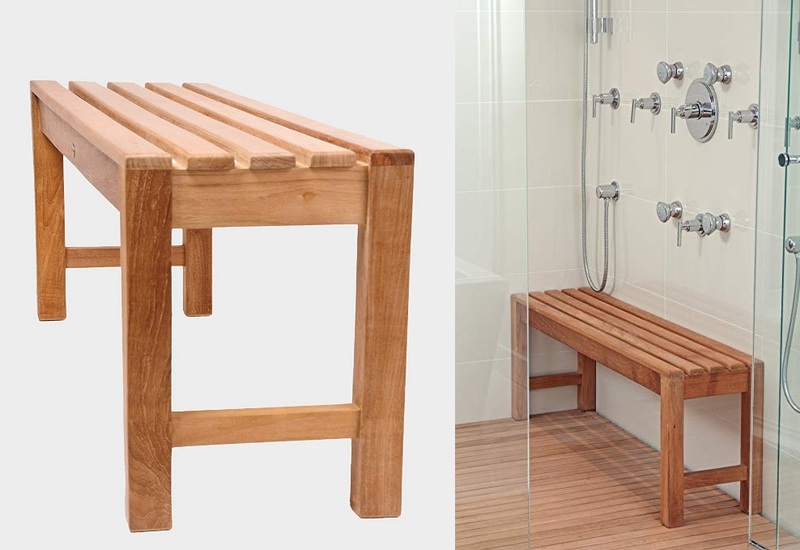 whatever your reasons for wanting a place to sit in the shower the ARB Teak’s Fiji corner bench should fit your need. 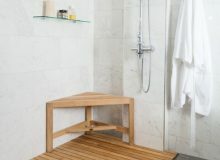 This compact three-legged shower bench will fit neatly into the corner of all but the smallest showers, therefore it would be tough to find a room that wouldn’t welcome its natural-wood finish and clean lines. Dimensions: 31.5L x 15.75W x 17.75H in. 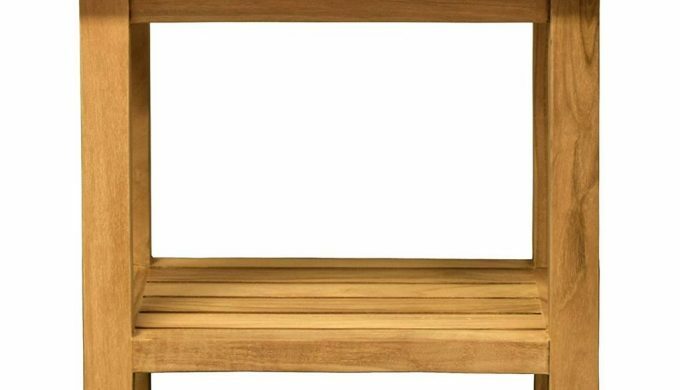 Get a leg up in the fight against whiskers with the arb teak small corner foot rest, a convenient shower accessory crafted from solid grade A plantation teak, a famously strong and durable hardwood. 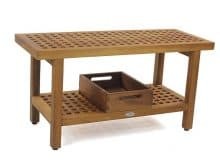 The high oil content of this handy teak bench provides natural resistance against mold and moisture, so you can shower, shave, and get on with your day with a minimum of maintenance and fuss. ARB Teak & Specialties is a premier manufacturer and distributor of luxury teak products. They specialize in custom-made furnishings designed to enhance the beauty of your indoor and outdoor living spaces. 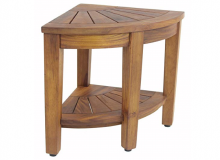 Their exceptional design and unparalleled quality have made them a preferred destination for all your teak needs. 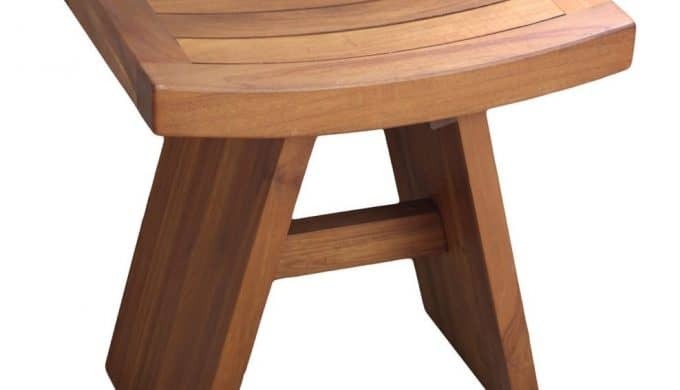 Their products made from responsibly harvested grade “A” teak and dried to perfection and beautifully finished. They use only the highest quality hardware made from solid brass and stainless steel, guaranteed never to rust. Teak is an extremely dense grained hardwood with a beautiful rich golden color. The Characteristics of teak include strength, durability, and resistance to insects, rot, and decay. It has high oil content, which continually preserves the wood and makes it perfect for wet/dry applications. 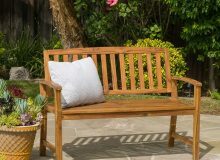 ARB Teak furniture is designed to last a lifetime. Their fine furniture handcrafted by the best Indonesian artisans. Native to the tropics, the teak tree is commonly found in southeast Asian nations, most commonly, Indonesia. There are few that take their teak more seriously than those in Indonesia. The government has been dedicated to managing the country’s most valuable natural resource through official teak plantations. Each year a pre-determined number of trees are cut and replaced by new ones planted in their place. 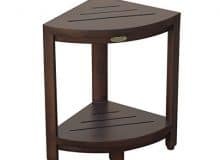 Oasis Teak Corner Shaving Foot Stool or Double Shelf is a fully assembled table with a compact design. It is 12’’ inches width and 18’’ high. It has solid teak that was stained dark brown in order to coordinate the décor. The leg leveling pads with the standard in order to accommodate the sloped floors. 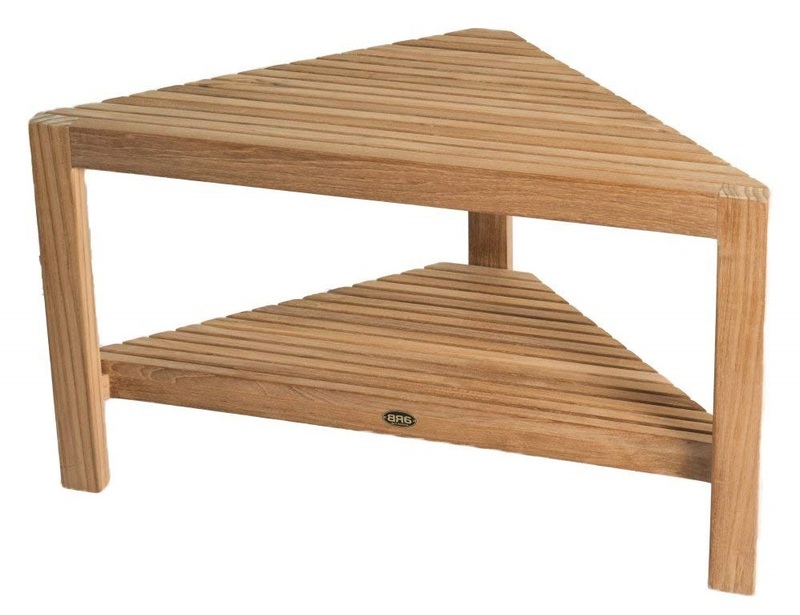 The shelf has slats to use for the water draining and it is perfect to have in your home. You can use it to rest the legs when you are in the shower. 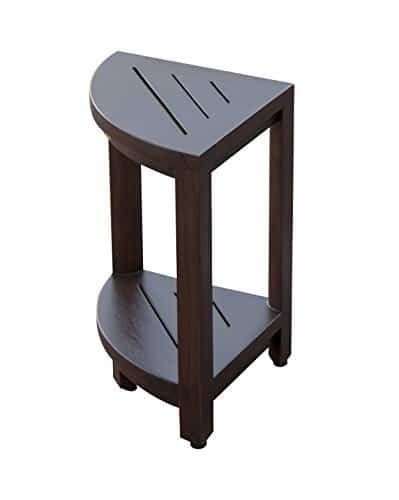 The stool comes fully assembled and you should take it out and put it in the corner. It is compact so you can use it in any corner of your shower. The Deco Teak is high enough to keep in the shower. 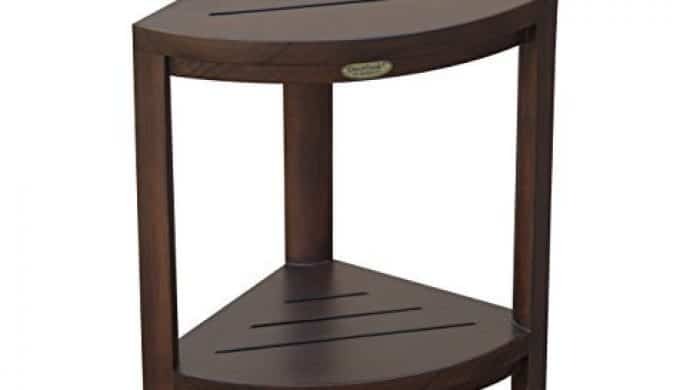 Its adjustable legs ensure that the stool is stable even on the sloped floor. The shelf will reduce the clutter in your bathroom since it helps with the additional storage for the organization of the soaps, shampoo bottles and the shower accessories that may need somewhere to store. The extra space can be used for magazines, towels and toilet paper rolls together with the favorite reading book. The corner style is effective especially in small places since most of the time; there is always an under-utilized corner in the bathroom. Teak is a natural good wood and it has natural high oil content with natural density. It has been the wood of choice for many years, now and the years to come. The shelf can use both indoors and outdoors. There are many people who have used the shelf and they are happy about it. It is good for the people who do not like the idea of using suction cups or medical shower seat. People who are looking for just the light size, choose to use this type of shelf. There is nothing to worry about this shelf since it is the right one but for someone who wants something bigger, he can go for its bigger sister. The shelf comes pre-assembled so there is nothing that you will have to do about it. The people who have a small bathroom can use the shelf to prop their feet and to use them for the toiletries. The stool is the perfect option, especially with its adjustable feet that can create the stability even on the sloped floor. The stool comes already assembled so there is no time to spend. It is a beautiful solid teak wood so there is nothing to worry about wetting. Some people just turned to this shelf after trying many things and did not disappoint them since it met their expectations. Besides being the right size to use while shaving, it is also the best option to use to keep their conditioner and shampoo that they need while bathing. The shelf can also keep soaps or washcloths. For the people who used the shelf for many years, the craftsmanship and the wood continue to look like the first time they bought it. 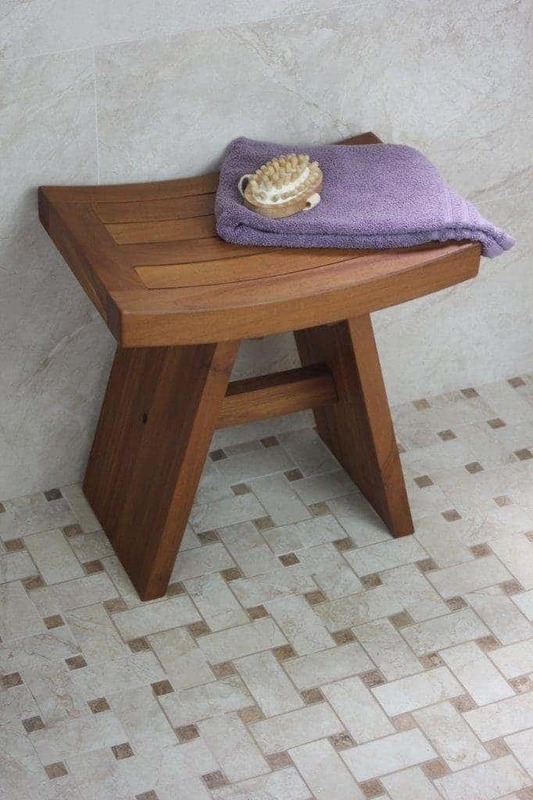 A Teak shower seat is not only the place to sit while having a shower in the bathroom, but it does more than that. You are away from many known troubles like sitting on the edge, sitting without comfort, bending of a seat on which you sitting, and standing on one leg etc.. You must feel complete discomfort while taking your chores. The shower seat not just provides you a proper place to sit; it might even save you from unwanted cuts which occurs due to some movements while shaving the legs. The shower seat always remains in water so you will have to think about the durability and quality of your shower seat. It should not start deteriorating on its quality being wet in water all the time. 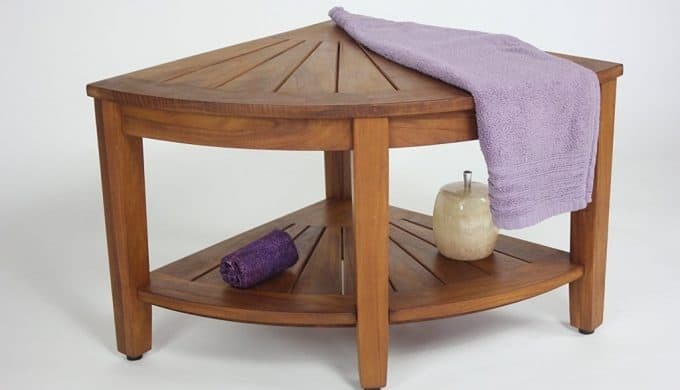 Any other shower seat will require being repaired very soon; but a teak shower seat is strongly resistant in constant touch of water and another element which can harm the shower seat like, heat, cold, rain, and moisture. The insect can also harm the shower seat by eating the wood. No need to stand in water or any soggy towel or a rug which is generating odor. 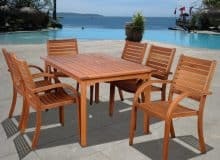 Durability: Teak seat is a durable and strongly resistant to the constant touch of water, moisture, cold, heat and rain. Its strength makes it more effective than?other shower seats. Smooth surface: Teak shower seat has the smooth surface which gives you more relax and enjoy while sitting on it. You will not feel the cold surface of a metal shower seat. Secure: The seat is more secure than other metal or plastic shower seat because you do not have to worry about the slippery. Elegant and luxurious look: Teak shower seat looks elegant and luxurious than other shower seats. It enhances the beauty of your bathroom. 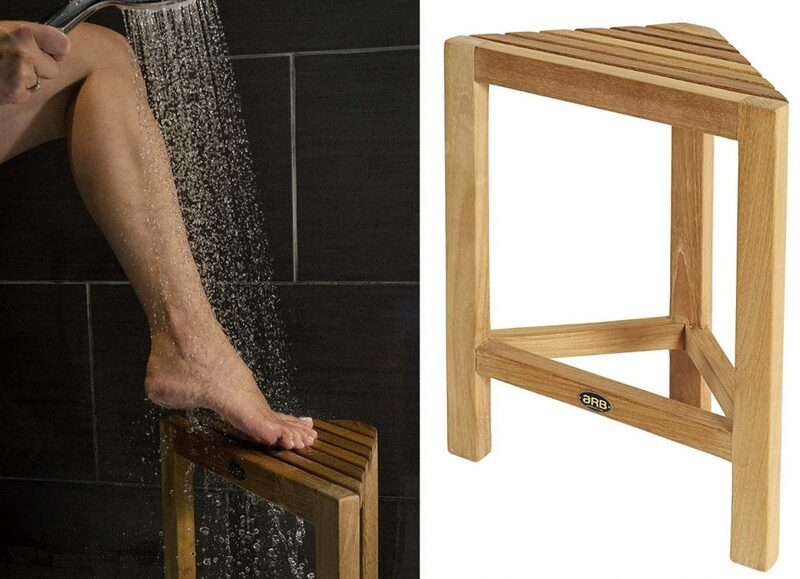 When you place any teak shower seat in your bathroom the beauty of other furniture and accessories leaves behind. 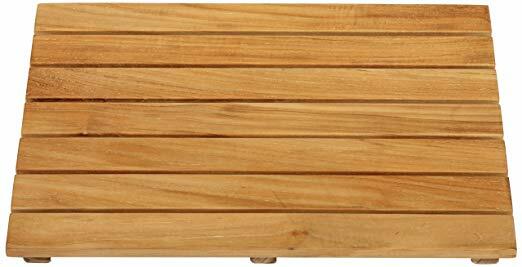 The teak shower seat is the best choice for anyone; rather than going for another wood shower seat or plastic or metal shower seat. It is a one-time investment which gives the facility and enjoyment of the dividend of investment. 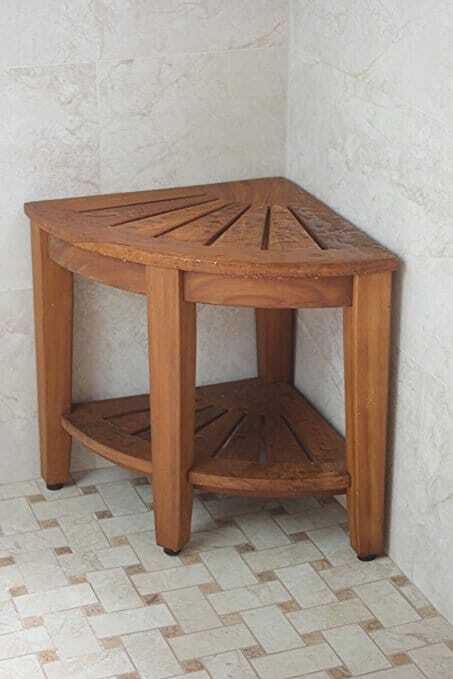 You do not need to worry about the repair and safety of teak shower seat since it is durable and secure. 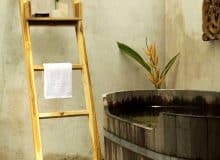 If you are sitting on a rich warm natural finished teak shower seat then you can have a feel of taking spa in your own relaxing home and no need to go anywhere else for this.